When my wife Sandy and I were house-hunting 11 years ago, looking to make the daunting leap from a Philadelphia row house to a slightly bigger spread in the burbs, our real estate agent took us to towns all over the place. Sandy and I examined a lot of homes. We wanted something middle-aged and attractive. And being a lazy guy who wasn’t up to taking on anything remotely resembling a major project, whatever dwelling I ended up in also needed to meet the definitions of renovated, clean and comfortable. After a few months of searching we came upon the house we now call our own. And one of the big reasons we said “yes” to it was a feature I’d hardly ever in my life thought about, let alone thought I’d want. But when I took my first look at the house’s deck that sat eight feet above and overlooked the backyard I said to myself: “Holy sh*t, this is da bomb! I want it!” And since then I’ve had it. But, dumbass that I am, I haven’t put the deck to extensive use. I’ve spent plenty of hours upon it, for sure, but erratically. This year hardly at all. When I want to laze I tend to do that indoors on the living room sofa where I practice spilling beer and dropping Cheez-It crumbs by the hundreds all over the cushions. I’ve gotten real good at those sports. I’ll note, though, that Sandy loves the deck. She’s thinking of moving onto it permanently, leaving her spouse to his own devices. About 7 PM one evening last month, however, the deck called to me. I was on my way into the kitchen from the dining room. 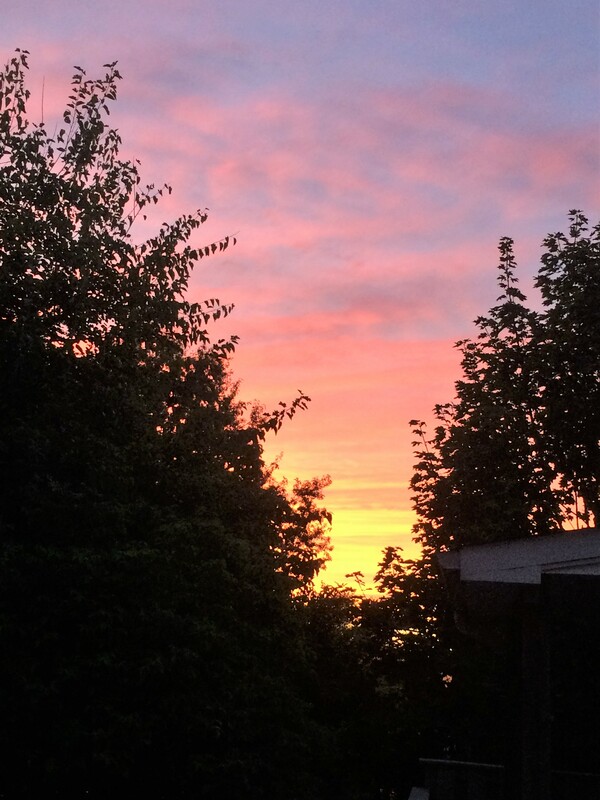 And, through the dining room’s glass door that leads to the deck, noticed the sky. 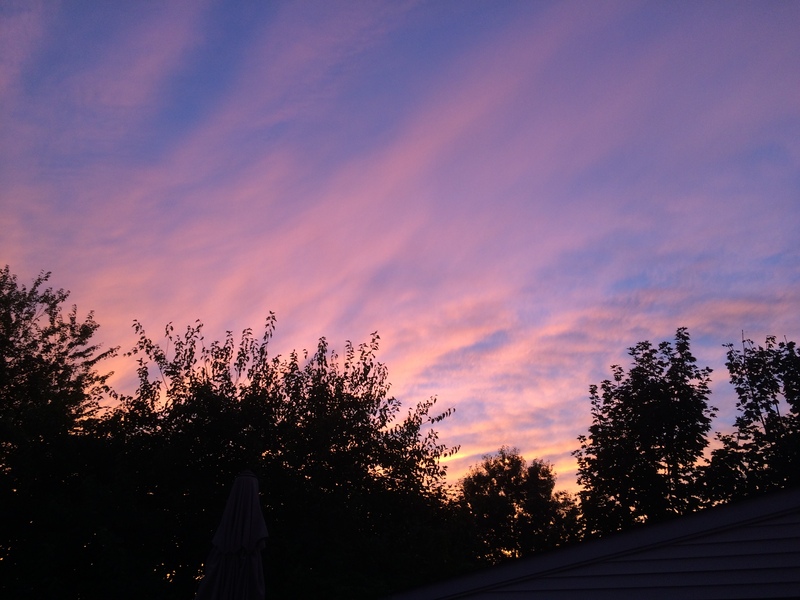 It was fabulous, streaked with pinks, oranges and yellows. Our friend the Sun had dropped below the horizon minutes earlier. A grand sunset was on! Chatham, Cape Cod. October 2015. Me, I’m a sunset guy, though you wouldn’t know it when I’m occupying space in my manically overdeveloped suburban region. Here, it’s kind of hard appreciating sunsets displayed above a landscape crammed with strip malls and gas stations and office buildings. So, here I’m not in the habit of seeking out sunsets. But I get into them in a major way when in beautiful open areas. Sandy and I are fans of Cape Cod, for instance. At many Cape locales the vistas are something else: endless waters, sands and, sometimes, marshes. When I’m surrounded with ooh la la scenery like that I get jazzed watching the Sun drop and the sky drip with colors. And it’s not just me. Lots of people are into sunset-gazing on Cape Cod. No matter which beach area Sandy and I have stood on to take in the event, a bunch of other folk usually are there too with the same thing in mind. 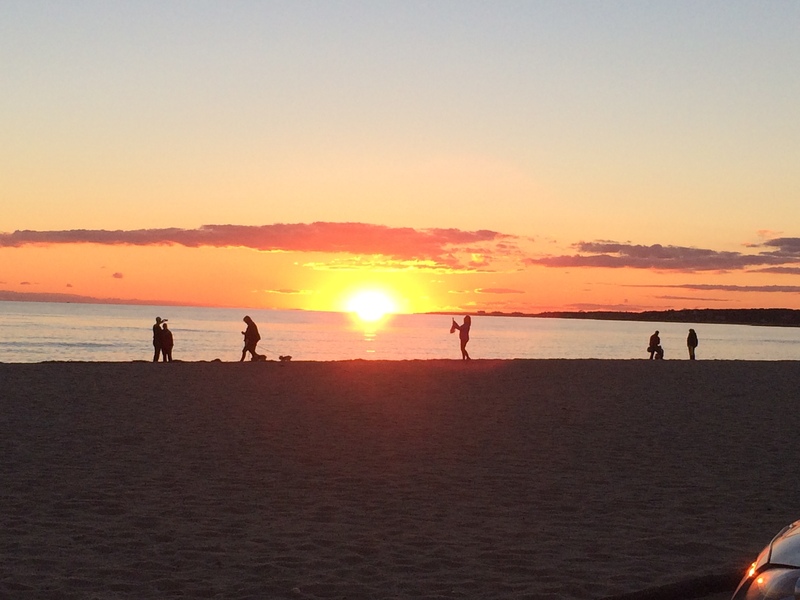 Sunset-gazing on Cape Cod, and no doubt in many spots all over the world, is almost a tribal ceremony, a quiet one that comes together seemingly spontaneously out of primal needs. 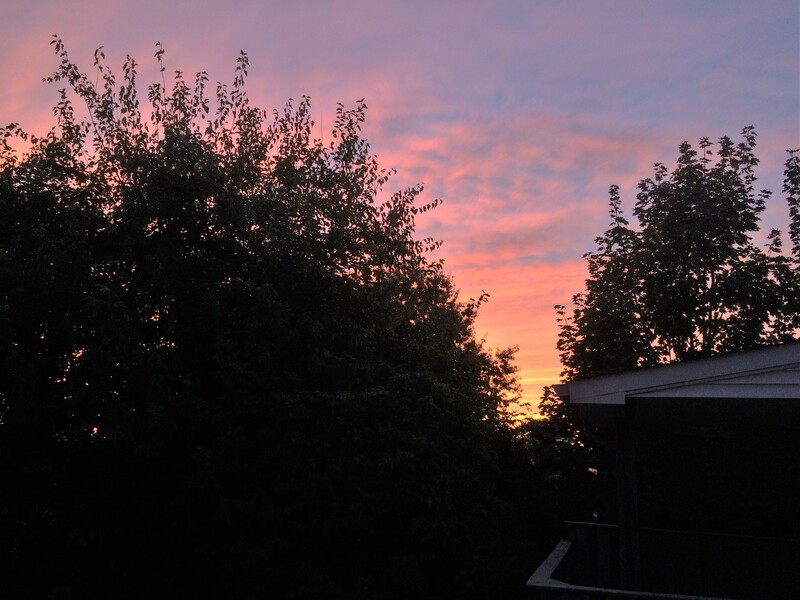 Cape Cod aside, I should but almost never remember to look at sunsets from my deck, the perspectives from which aren’t disturbed by strip malls et al. Sure, that perch isn’t the perfect one to take in the sky, what with the trees out back obscuring views profoundly. But, hell, it’s still awfully nice. What’s more, things seem pretty peaceful on the deck, since there are no cars going by. Peaceful, that is, till one of the multitude of nearby canines starts barking its fu*king head off. But I digress. Yes, the sky was fabulous. I grabbed my iPhone, turned on its camera and went out onto the deck. To the south only half of the sky was visible, due to several big boy trees. Within the tree branches, though, bits and pieces of sunset hues played a cloak and dagger game, which I thought was awfully cool. And above the trees? Man, the painting was great, with swaths of pastel tones floating in darkening blue. To the west was a somewhat different type of story. A few trees condensed the just-above-the-horizon view to a fairly narrow opening, but the gap was enough. Gorgeous colors drenched that section, the yellows falling lower and glowing brighter by the second. What can I say? I got drawn in. I dug it all, to the west and to the south. And I snapped pictures, as if the 500 billion sunset photos already taken by humankind since the invention of photography weren’t enough. Yup, there’s something about sunset pix. I’m not embarrassed to toss a few more into cyberspace. Next Article To The Beach! Your pics are fabulous! Beautiful, beautiful colors…Your deck is definitely positioned to take advantage of this amazing spectacle! You know, for years I’ve been reminding myself that I should go and look at sunrises occasionally, too. But I never seem to remember to do it! One of these days . . .
Nice photos. I find myself doing exactly the same thing some evenings. Just grabbing a camera and dashing outside. Hi Martin. I’m glad I got a smart phone last year. Having its camera at hand is a great thing! We have a balcony outside our bedroom that we never use, because my non-handyman partner thinks the timber might be rotted and we could end up falling 8 feet to the ground and smashing our glasses of chardonnay. 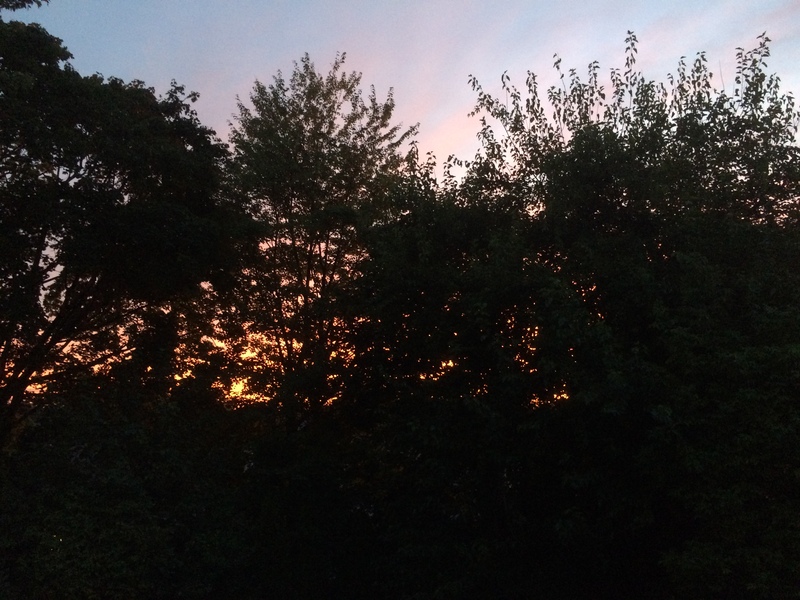 But nevertheless I love the view from our room at sunset, usually of a patch of sky enclosed by trees – very similar to your view, but on the other side of the world! Hi. I like your suggestion about the trees. It’s time for them to go! Enough is enough! Beautiful sunset pictures! You do have a good view from your nice deck. Enjoy! Decks are intended to be private orientated to the back. 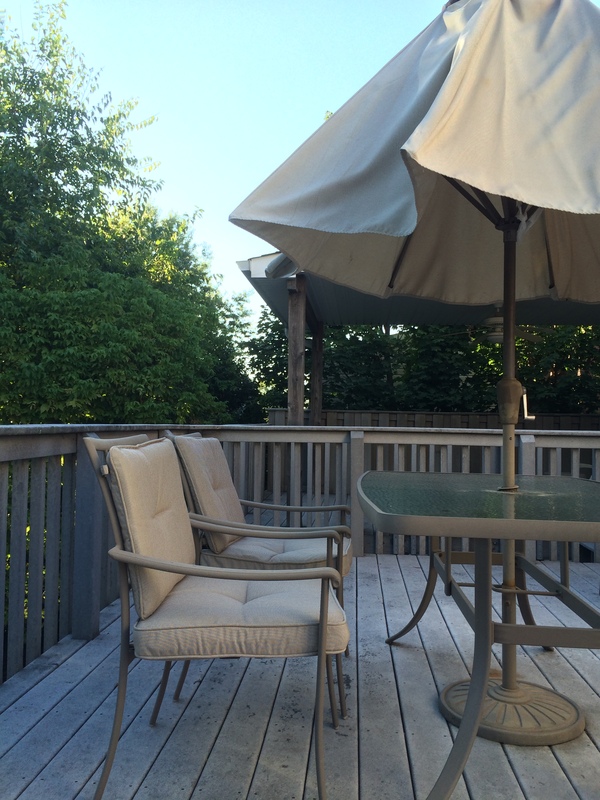 As much as I love our deck, the concept of porch, extending into the community is recommended. Enjoy your reflection on a simple activity. Thanks for commenting. I enjoy your perspective on the subject. I had never thought about the differences between decks and porches. Nice article. We had a massive Leyland Cypress at the bottom of our garden taken down earlier this year, and that’s made a huge difference to the oriental-style area we have down there, particularly as regards contemplating the sunset on a warm(ish) evening, a glass of something cold in hand… keep your eyes on that horizon! Hi Andrew. That’s the problem with much of suburbia — i.e. you can’t see the horizon! Yeah, sunsets. When they’re pretty, the are also magnetizing or maybe the word is mesmerizing. Glad you got these to share. Hi Janet. You definitely chose the correct words (magnetizing; mesmerizing). Hi Lucie. My wife and I unexpectedly fell head over heels for Cape Cod in 1998. We’ve been back most every year since then. And speaking of Martha’s Vineyard — she and I had our honeymoon there! You’re right — The Cape and Islands are fabulous. I hold the diverging and simultaneous opinions that any photograph a sunset is a photograph worth looking at and that no photograph can capture the all-encompassing splendor of a worthy sunset. And I’m sticking by my opinions. Something I like about sunsets is that they have a lot of variety, and some can be grander than others. One day’s sunset is by no means likely to be similar to the next day’s.